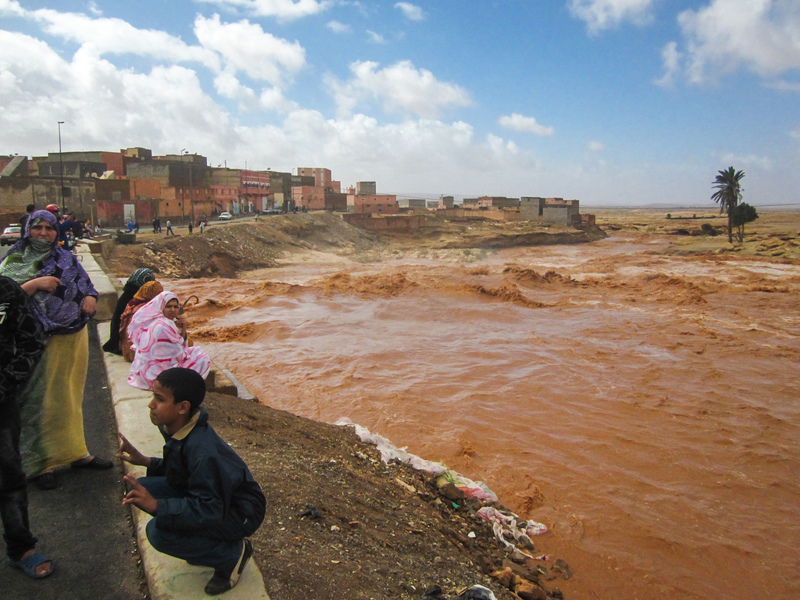 Floods in Guelmim, Morocco in March 2013 (Credit: jbdodane; https://www.flickr.com/photos/jbdodane/). Despite the measures taken to mitigate carbon emissions, human-induced climate change now appears inevitable. Its effects are already felt and projected to intensify in the coming decades (IPCC, 2014). This global challenge threatens to disproportionately affect the poor and to jeopardize development achievements of low income countries (Hallegatte et al. 2016). Currently, North Africa faces serious environmental and socio-economic problems that affect livelihoods, economies, and the political stability of the region (Drine, 2011; De Sousa Ferreira, 2014). These include, among others, increasing water scarcity and pollution, declining crop yields, soil degradation and desertification, deforestation, population growth, marked rural-urban migration and high levels of unemployment, which particularly affect the youth (Gubert & Nordman, 2008; ILO, 2011; De Sousa Ferreira, 2014). Climate change can act as a “threat multiplier” (Femia & Werrell, 2012) in this context, putting additional burden on people and institutions and diminishing their ability to respond to the mix of existing and inter-related threats. This Thematic Input Paper (TIP)* provides an overview and a succinct discussion of climate change and natural hazards in North Africa. The TIP addresses the climate change and migration nexus from the perspective of disaster risks and employment, and focuses on the context of Morocco, Tunisia and Egypt. In the TIP the results of a non-exhaustive analysis of regional and national information and data are presented, and the implications of observed climate trends and future projections for development are discussed and complemented with a case study for the Nile Delta, in Egypt. Figure 1 from page 3 of the report: Climate-related disasters recorded in North African countries in the past 20 years. The left figure presents the relative frequency of disaster types during this period in the region (the analysis included Morocco, Egypt, Tunisia, Libya, Egypt, Sudan and Algeria) while the figure at the right shows the frequency of climate-related disasters for the three focal countries. In parenthesis is the absolute recorded number of disasters per type. Source: EMDAT database accessed on 5 February 2016. Section one describes how the geographic context of North Africa determines its exposure to climate change and disaster risks. It also presents observed climate trends and an analysis of past extreme events recorded for the region. Section two shows the results of climate change projections undertaken for three key climatic variables for short and long-term time horizons (2030 and 2100, respectively). These are complemented with published projections for other variables and analysed along with existing and relevant literature, to offer an overview of potential climate impacts for the region. Section three analyses the nexus between climate change, disaster risk, migration and economic development. Section four offers agricultural management responses to climate change and climate hazards in North Africa, and section five lists identified knowledge gaps. The TIP also takes a specific look at Flooding in cities of North Africa, Climate change and surface water resources in Morocco, and Sea level rise threatens the Nile delta. This Thematic Input Paper was prepared for the Swiss Agency for Development and Cooperation's ‘Agadir Regional Thematic Exchange Meeting’ (ARTEM) on ‘Climate Change, Disaster Risks, Migration and Economic Development’ by Clara Ariza (Independant Consultant) and Henri Rueff (University of Basel).